“Facts” don’t kill the deal they just up the ante. They provoke you to think more clearly, and plan more intelligently. When you’re presented with the facts, you may not like what you hear, but you deal with it, and invent ways to keep moving forward. That’s what artists & treps do, they innovate. However, facts aren’t the problem. Drunk Monkeys are. Buddha described the human mind as being filled with drunken monkeys, jumping around, screeching, chattering, scratching, spitting, carrying on endlessly. 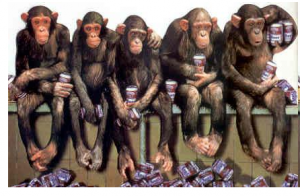 We all have monkey minds, with dozens of drunken monkeys all clamoring for attention. Fear is an especially loud monkey, incessantly sounding the “what if” alarm. Procrastination is the cunning monkey, who persuades you to slow down your progress to a crawl. Resistance is the soldier monkey who prevents you from moving forward. Distraction is the bandit monkey who robs you of your focus and attention. Sabotage is the heartlessly monkey who constantly derails your dreams and visions. And Doubt is the skeptic monkey who relentlessly questions and demeans your talents and abilities. The trick to silencing the drunken monkeys? Keep your eye on the prize and your focus on the facts.